GOG.com - Little Big Adventure Free Today! Get Little Big Adventure free today on gog.com through their "Vive La France!" promotion! Little Big Adventure is a qwirky adventure game I very much enjoyed back in the days I was first learning to build and fix computers. GOG.com is offering it free for 24 hours if you click on the link above, and is offering its sequel at 75% off! There are a lot of other great games like Syberia, Syberia II and Robin Hood: The Legend of Sherwood. Go GOG, or go home. Tonight, while testing Motocross Madness 2 network connectivity in virtual machines (both Windows XP and Vista) across the internet with Thundr, I realized our website has been missing all of the Best Lap scores for probably 5 years or more! After successfully completing a multiplayer race on Machkeu Basin, we decided to look up the best lap to see how close we fared after many years away from the game. Seeing they were gone, I panicked and started searching my source code history to find them. After realizing I'd ported the site to a new repository and hadn't brought the history with it, I wanted to cry. Thanks to the help of the Internet Archive "Wayback Machine" I was able to restore the missing records to our live site. This will make the upcoming Turkey Bowl LAN party more enjoyable as we make a long overdue comeback to MCM2! 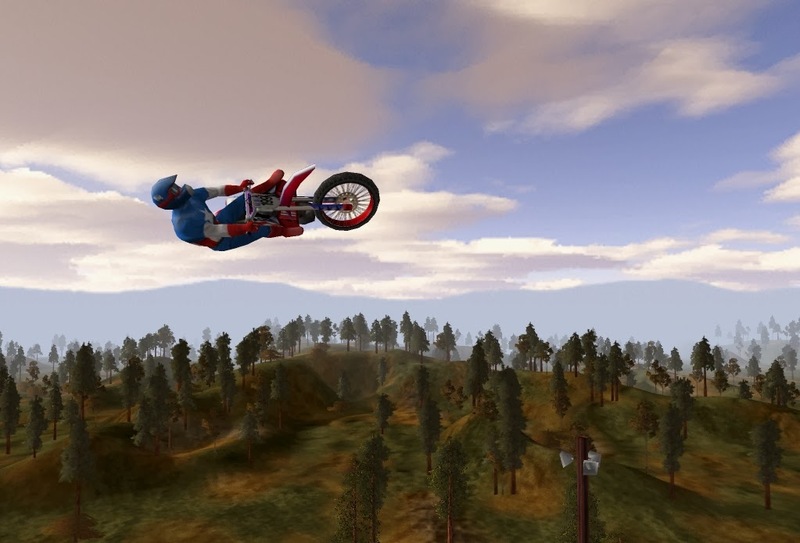 Go check out what you're up against at our Motocross Madness 2 page. Some of the scores have VCR files that you can load in the game and watch the replay of the record being set. I don't know about you, but I'm setting my sights on shattering Dave Holland's records on "Machkeu Basin" and "Snowfields". I'm really looking forward to some high-flying, spring-loading good times with you all as we bring back this epic classic to Friday Night Gaming! I can't wait to hit Bear Mountain and Halfgrand Playground for some intense stunt matches, "have a ball" in the smaller arenas playing Stunt Ball Tag, and get "TIMERED!" on the National tracks we love so much. I was able to successfully update the ManiaPlanet servers to the 2014-10-16 version. Hunger Games server should now be up all the time (replacing the Card Melee server for now). Please let me know if you run into issues on any of them. 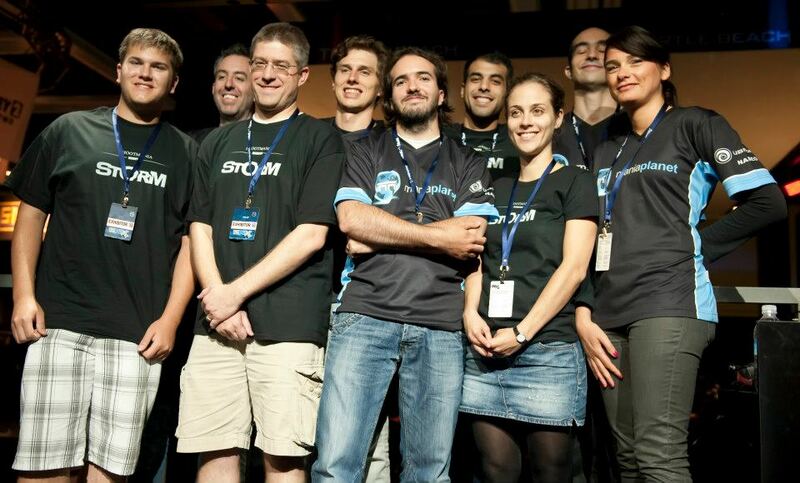 Last November during our TrackMania 10th LANniversary Celebrat10n party, we had an epic online tournament spanning all of the TrackMania environments. Some of the ARK racing team participated in that tournament. 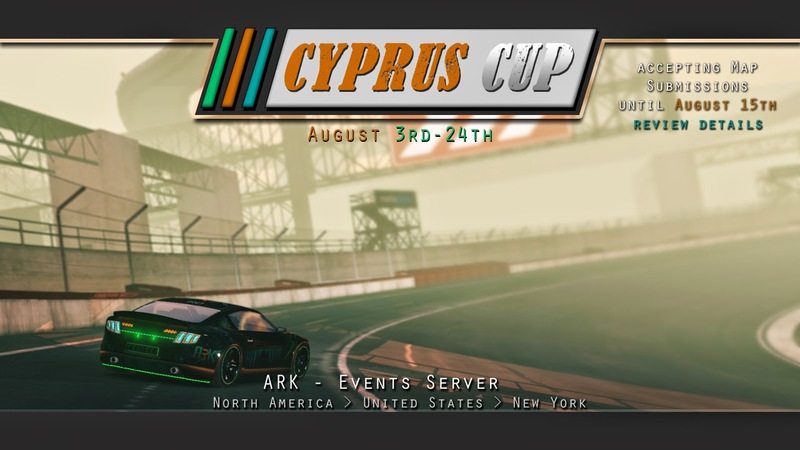 Now, for nearly the entire month of August, the ARK Racing team proudly presents the Cyprus Cup. Each weekend in August they will be racing 3 maps in Time Attack mode in the TrackMania 2 Canyon environment. 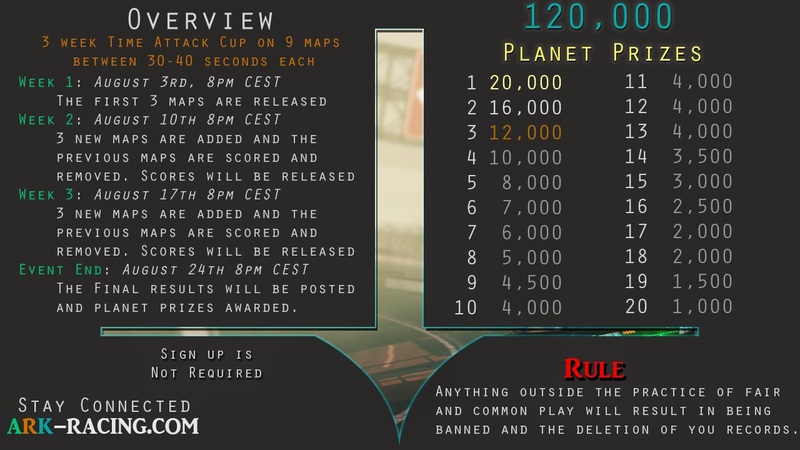 120,000 planets will be awarded in this competition; the breakdown can be found below. Full details can be found at the ARK Racing website. I'm so glad we have seen a huge influx of player in the world of ManiaPlanet in the last 72 hours, thanks to an incredible Steam sale titled, "From Paris, With Games." 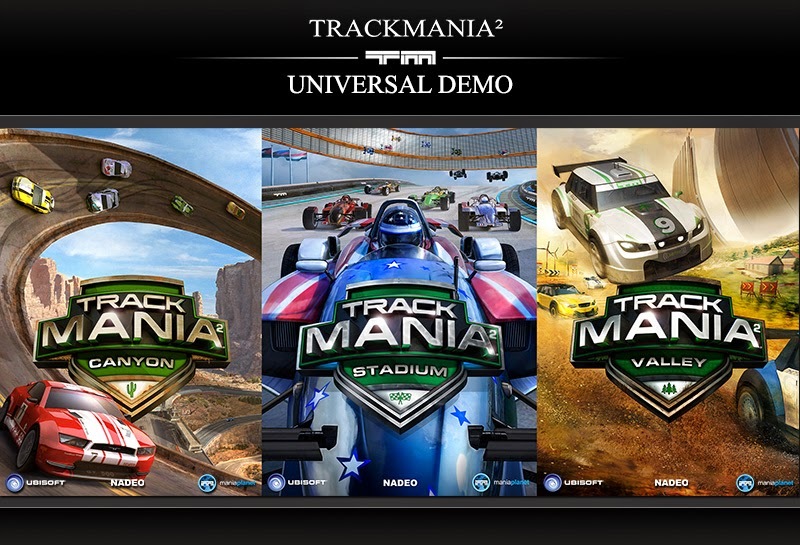 The sale found TrackMania 2: Stadium marked down to $2.49 USD. Within 3 days, our Team FNG servers have seen over 2000 new players, many of which I had the pleasure of meeting and helping them learn about the epic awesome that is TrackMania. Our ShootMania Royal server also found some new friends as its price dropped to $4.99 USD. With the excitement building around TrackMania 2 Stadium, new Steam players have also been investigating and adding Canyon and Valley to their collections. By now many have come to find a slight frustration with the Steam version of ManiaPlanet where they have to dump out to Steam to switch game titles. I have confirmed with Nadeo that, due to limitations in the Steam version, the Universal Demo is only available in the standalone ManiaPlanet. Please see the official Friday Night Gamers website for full details on why and how to get the standalone ManiaPlanet installer. FNG TrackMania Servers' Record Keeping is Back! I'm happy to announce that I finally have the XAseco2 servers back up and running with our Team FNG TrackMania 2 servers. Sadly, we don't get to take advantage of the new script-based "Time Attack" mode which gives us the cooler in-game scoreboards that are themed per environment, but we'll live for now. I may start investigating to see if XAseco2/Records Eyepiece has plans to support the scripts. If so we'll stick with them. If not, I'll investigate newer server controllers that support the new script modes as well as keep records. If I can find a good one, I might switch over, but XAseco/XAseco2 have done us well for so long, it will be hard to give it up. 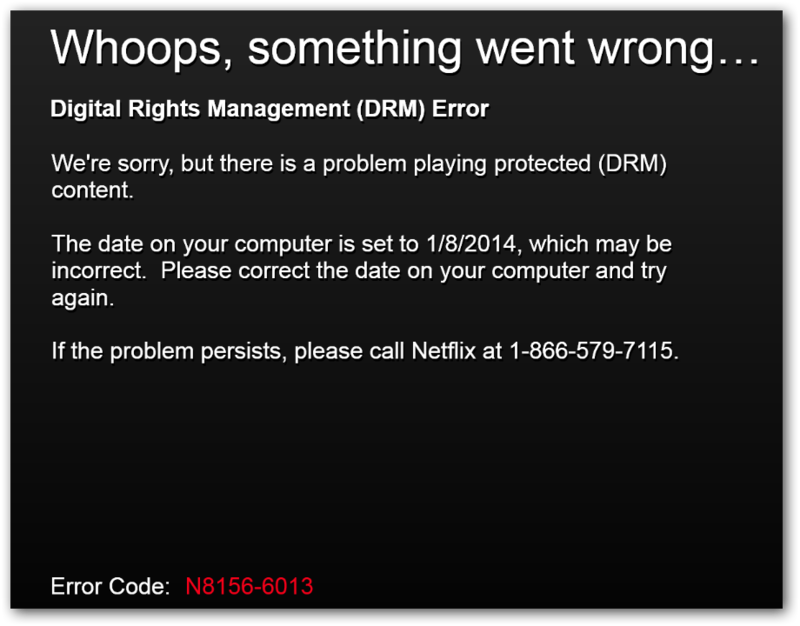 I was trying to punch up some "Doctor Who" while I exercise today (08 Jan 2014). I guess it's no longer alright to have your computer set to the correct date. ... and I'm back in business.